Built in Italy in 1990, the M/V Galapagos Explorer II is the newest and safest of the vessels cruising the Galapagos' waters. Navigating at a speed of 17 knots, the Explorer II enables passengers to see more of Galapagos in less time. It is designed to provide comfort and scientific information to 100 passengers visiting the Galapagos National Park. Its operation is emphasized with interesting itineraries that offer the best of this pristine paradise. Expert naturalist guides will offer an environmentally friendly and educational cruise focused in the Natural History of the Galapagos. 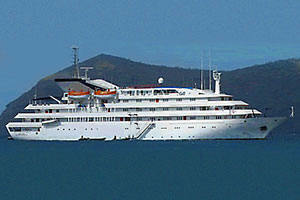 The ship provides all the facilities and services to make the cruises enjoyable and comfortable. Features aboard include swimming pool, Jacuzzi, solarium, spacious dining room, an electronic elevator, large conference room, lounge, three bar areas with music, Boutique and reading room. The ship has 53 air conditioned outside Suites, each one with private bathroom and a small sitting area. VHS, data projector, slides projector, computer, folding screen TV, audio equipment and microphone, white board, DVD y CD player. AM: Bachas Beach, Santa Cruz Island & Baltra Airport.